I gulped and spouted something about listservs and ISPs and HTML. So, here I am, admitting it: I’m a lousy blogger! Now that we have that out of the way, I have two important pieces of news to share. First, See Before You Die: Patagonia will be released early next year. Second, I received a new assignment: 3 years in Europe! It will take some time for my stories to catch up to all of this, but as a reader of my heretofore lousy blog, you will see sneak peaks of adventures to come. Stay tuned for live updates from Europe. I’m no Rick Steves, but I’m betting you’re not the shirt-buttoned-to-the-top kind of traveler either. So here’s the inside scoop for the six loyal readers of my blog: I am now based in Germany! 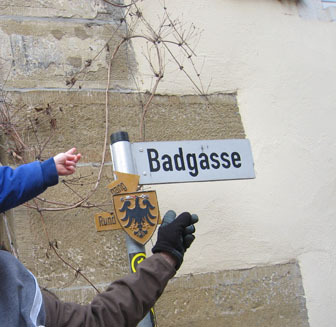 Who can resist a land where beer is cheaper than bottled water and the people are comfortable using words like fahrt and badgasse in everyday conversation? German lessons start right away. This is pronounced owf veederzayhen and it means Goodbye! Yeah…you’re back! Looking forward to more excellent writing and fun stories! Thank you. It’s great to be back! Thank you for visiting me on Facebook!